Islamic school helps in preserving Islamic identity for the community at large, and for the children more specifically. It provides an environment where the students can practice their religion freely and receive feedback to improve their understanding of Islam. It helps our children achieve the best of both the worlds in a secular environment. It focuses on Islamic Skills and Qualities according to the Quran and Sunnah in a multi-cultural Society. Children excel in all aspects of their life when they grow up in a safe and nurturing environment. OFSTED have said that “our premises and accommodation are well maintained and the facilities are good” and we ensure parents and carers are well informed about their child’s progress with reports and with parents’ consultation evenings. The leadership, management and staff of Al Islah Girls High School are firmly focused and committed, in working towards a school which will provide an exceptional quality of education by significantly exceeding minimum requirements. WHAT WILL BE THE LEARNING EXPERIENCE AT OUR SCHOOL? 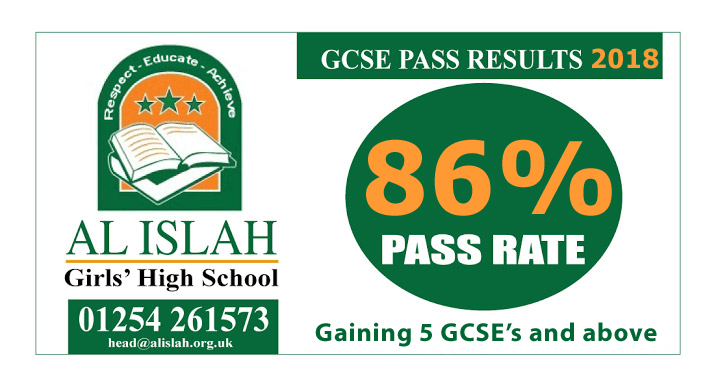 Al Islah Girls’ High School provides an atmosphere of order, purpose and pleasure in learning and this is supported by the last Ofsted inspection statement that, “students all say they feel safe and that they enjoy coming to school”. Many talk of the school as “being like a big family”. Our ethos of “respect, educate and achieve” is a golden thread, which runs throughout Al Islah Girls’ High School to ensure pupils are supported, guided, and motivated to achieve their potential, in a positive, caring environment. The experience at Al Islah Girls’ High School will naturally install Islamic values to build an even more enhanced character. WHAT WE AIM TO DELIVER? When a student completes their education at Al Islah Girls High School, they will hopefully leave as a high achiever and someone who is well disciplined, responsible, tolerant, confident, caring, respectful, understanding, law abiding, model citizen with strong Islamic values (Insha-Allah).